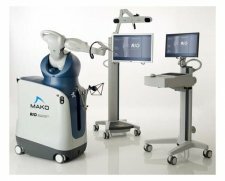 Mako Surgical pioneered robotic-assisted surgery in orthopedics and the term “makoplasty”. Its system comprises the Rio Robotic Arm, which enables surgeons to precisely and consistently cut through bone. The incisions are designed for the company’s Restoris implants, including partial knee resurfacing in people with early or mid-stage osteoarthritis. Stryker obviously really wanted to add a robotic surgical option to its portfolio, the purchase price representing an 86 percent premium over Mako’s most recent closing price. Stryker CEO Kevin Lobo said the addition of Mako’s technology to his company’s established position in operating rooms, joint reconstruction and surgical instruments will spur the growth of robotic assisted surgery.